Did you see last night's lunar eclipse? Fortunately eclipses last a while, because Yvonne and I were being treated to dinner at our favorite Thai restaurant. We spent about two hours at the restaurant and when we got outside around 10PM the eclipse was still in full effect. Above is a sequence of images I shot during the eclipse of October 27-28, 2004. I am somewhat of a space geek. Without a doubt, my favorite movie of 2007 was In The Shadow of the Moon, which I saw in the theater twice. I'm always checking out NASA's various websites for all its missions from the twin rovers on the surface of Mars to the Cassini satellite currently orbiting Saturn. It's amazing to me to think that yesterday alone we had a trifecta of events occur: a successful landing of space shuttle Atlantis, a missle launched to explode a crippled satellite, and of course the eclipse. A few weeks ago I had to rent a 300 f/2.8 lens to shoot a concert at BAM. The assignment ended up getting cancelled. But I decided to go up to the roof with the lens and shoot that evening's full moon. The pictures are nothing to brag about, but I thought it was appropriate to share. 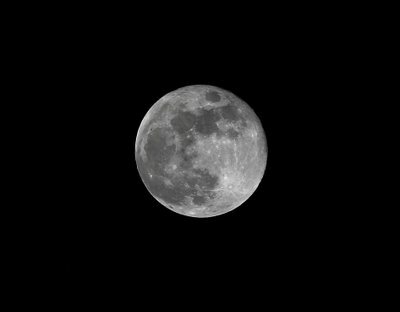 I had to crop quite a bit to get in tight on the moon. But you can see some craters and whatnot. The picture was taken January 22 and was shot at ISO 50, 1/500th at f/5.6.